You’ve done things in your life, you champion, you. You might have had a fight, or given birth, maybe crashed a car. You’ve maybe even done a gig in a chicken-burger suit outside a McBurger-Joint. The memories fade pretty quickly as we move further away from the event through time (well, maybe not the chicken suit one), with the exception of over-arching feelings and the high points. If you’re wired that way, you might keenly remember the lows too (and you have all of my hugs if this is you). Look, my point is that these very real and visceral things can slip away over time, and leave your writing less flavorsome. What you need is a flavour-saver, and for once I’m not talking about beards. What I’m suggesting is this: next time something big is happening in your life, and you’re probably about as far away from thinking about your writing as you can be, try to take some notes. Get to a computer if you can, but if that’s not an option at least jot down a few scribbles on that beer coaster or flossy undergarment. Your future self will thank you when they need to write that particular scenario. So my example of this? I’ve got a character who drinks, but I’ve been struggling to write a good hang over. Today I have some first-hand experience. I still don’t know if I’ve got the scene down perfectly (Terry Pratchett’s Commander Vimes scene at the beginning of Guards, Guards! is the greatest of all time in my mind, perhaps closely followed by one from Joe Abercrombie in his fantasy western Red Country) but I think it’s a lot closer than my previous attempts. I include it below for your interest, please note that there’s a bit of TMI, so skip past if that’s not-your-cup-of-tea. Nothing hurt until I woke up. Taste of warm lime-ade, a combination of last night and eight hours mouth-breathing. Nose stuffed with cotton wool, and hawking a sample into half-empty glass brings no closer to identifying. Movement sends discomfort radiating from head. No analgesics in vicinity, getting up not an option. Sleep. Wake up later. Bathroom. Interesting getting there, clothes scattered across carpet. Standing initially fine, moments later blood pools in feet. Sweat. Legs shaky. Glad I’d grabbed wastepaper bin on the way. After, put on wife’s onesie; anything else too much effort. Eat pie, because easiest to cook. To prevent reappearances, climb back into bed. Watch youtube. Anything more challenging than Dr Horrible’s Singalong Blog would be bad idea. 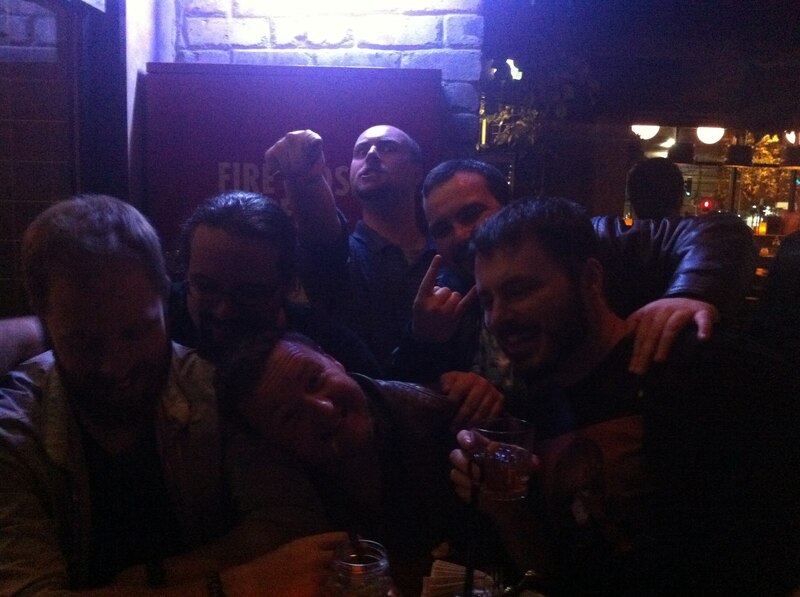 It was a good night, from the bits that I remember. Happy 30th Birthday, me. What’s your all time favourite (most amusing) hang-over scene in a book? Have you written an intense scene (any kind) drawing from your personal experience? Bonus question if you answered that second one – how hard was it to dredge up the memories in your case? This entry was posted in Writing and tagged drinking, Hang Over, joe abercrombie, note taking, Terry Pratchett, Writing. Bookmark the permalink. Happy birthday! I’m having flashbacks of a raucous night out that almost resulted in a bar fight (you can take the girl out of Brooklyn, but you can’t take Brooklyn out of the girl, especially when Jack Daniels is involved). Tried to stop the room from spinning. Failed. Felt like my head had been put through a meat grinder. Oh god, yeah I know the room spinning one. You need to hold onto something, but that doesn’t help, and closing your eyes makes it spin faster. Last time that happened to me was a looooong time ago (14 years ago? ), and now looking back the amount I drank was cute. Awww look at the little lightweight go! I just had a horrible realization. My eldest son will be 30 in July. Won’t be long before I start to fart dust. Your advice to write in the moment rings very true. Some of my best snippets came from writing during the experience. That’s where honesty comes from: firsthand experience. When we write in the moment, we don’t even need to try to recall sensation, feeling, or thoughts and situations because it is unveiling before our eyes. I used to write like this via iPhone, but somehow that’s now more difficult than writing with a small notebook. Something about the urgency of capturing the present is better done through pen and paper. I have a leather bound notebook and an ink nib pen that I’m using to record stuff for my daughter. Advice, memories, lists of awesome lady explorers/entrepeneurs from history… that kind of junk.